Blog Quick Quotes: Oh Baby with Rebecca! Hello, everyone! It's Rebecca here today with the blog post. As the baby of 12 children, I have lots of nieces and nephews as well as great-nieces and nephews! I try to scrap a layout for their albums that is special and unique. 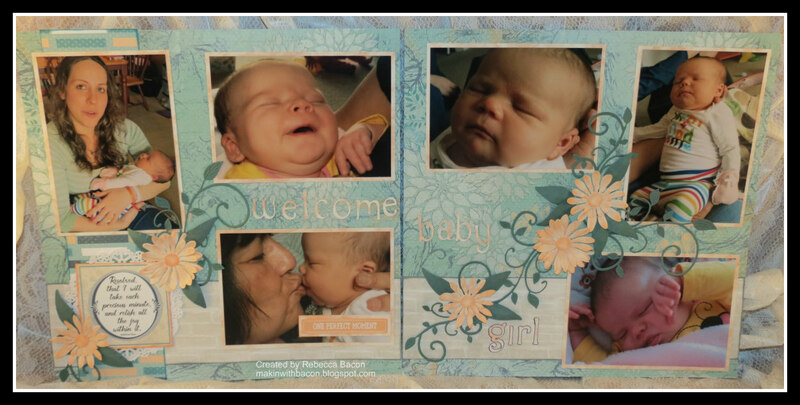 Today I share with you a layout for my great-niece, Rylie Paige. I cut three strips of paper 3 x 12 and inked the edges of each. Next, I matted all of my photos. I then die cut several flowers and flourishes. After attaching the two strips horizontally at the bottom of both pages, I glued the third strip vertically along the right side of the layout. I added a doily from my stash and attached a phrase from the cardstock phrases sheet. Finally, I cascaded the remaining flourishes and flowers and added the title. This layout will make a great addition to my great-niece's baby album. I hope I inspired you to get scrapping today! Thanks for stopping by the blog today.